ATTO XstreamCORE storage controllers act as external adapters adding a common set of services and features to flash SSD and HDD based JBOD, JBOF or RAID storage devices. 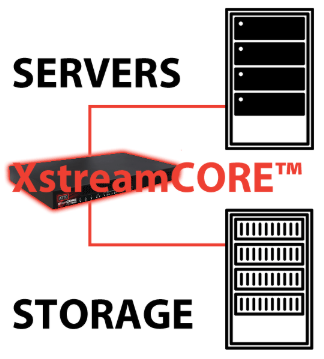 XstreamCORE then remotely shares this storage over long or short distances using Fibre Channel technology. Use cases for these controllers include the remoting of storage from servers or other storage mediums over a Fibre Channel SAN, sharing a pool of high speed flash to multiple connected systems, connecting data centers for business continuity via a stretch cluster and disaggregating storage from servers to independently scale compute and storage. Higher storage latency slows real-world performance, server based storage architectures depend on general purpose processors to transfer data, manage storage and add services and features to storage. When services and features are added, the CPU has to process each command in software which increases overall latency. XstreamCORE features a more efficient architecture that separates data traffic from services and features removing any non-data request from the data path to maintain a consistent level of latency and performance. ATTO developed the xCORE Acceleration Engine to handle the majority of I/O operations in a hardware processing pipeline without software intervention. xCORE manages all I/O, command routing and decoding, buffer allocation, reservations, access controls and provides real time data analytics. Any exception is off-ramped to the eCORE Control Engine to manage commands which do not require acceleration. ATTO xCORE technology enables the ATTO XstreamCORE to achieve up to 1.2M 4K IOPS or 6GB/s throughput per controller while adding a consistent sub two microseconds of latency. xCORE Data Acceleration technology features multiple parallel I/O acceleration engines with end to end I/O processing, hardware buffer allocation management and real-time performance and latency analytics. These features combine to provide very high, reliable throughput and IOPS while adding less than four microseconds of latency. The eCORE Control Engine adds common, open storage services, integrates with industry standard APIs, handles reservations, storage routing and host and LUN mapping functions. The eCORE Control Engine also manages traffic for data mover offload functions with added error handling and diagnostic tools. These features add value to JBOD, JBOF or RAID storage while providing tight integration with server based software. ATTO XstreamCORE is a solid state appliance that connects SAS SSD and Hard Drive solutions using standard JBODs, JBOFs or RAID arrays to Ethernet or Fibre Channel networks. Attach up to 960 total drives to multiple servers and assign drives on a drive by drive basis to one or many servers. Manage storage through in-band or out-of-band methods for flexibility and integration with most server-side software plus features such as ATTO Drive Map Director™ provide reliable, static storage configurations ensuring that operating costs are kept low and complexity is not a part of the solution. 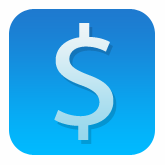 ATTO XstreamCORE integrates with commodity level storage and allows you to only pay for storage as it’s needed. XstreamCORE disaggregates storage from compute resources so you are not forced to add the expense of more servers and more software licensing costs when you only need to increase capacity or add flash storage. With a performance footprint that drives full racks of storage, it doesn’t take long before you become a hero for saving significant budget dollars. ATTO XstreamCORE provides flexibility for your existing storage and networking infrastructure and supports various use cases. Add storage to space limited blade servers – XstreamCORE features mapping technology that allows IT administrators to assign individual or multiple drives to a single server or multiple servers. The flexibility provided by XstreamCORE allows the mapping and assignment of up to 960 commodity drives without the cost of expensive all flash array storage or Enterprise storage licensing. When you have isolated SAS storage silos, XstreamCORE connects this stranded storage to shared Ethernet or Fibre Channel SANs allowing greater flexibility and usefulness. Even if there is no SAN installed the benefits that XstreamCORE will add are enormous including the ability to increase the speed at which live migration of virtual machines take between physical server hosts. As compute and storage have worked together, limitations with expansion have been exposed. XstreamCORE enables adding storage without adding compute, meaning you can add as much storage as you want without purchasing a storage solution or licensing cost for something that is not needed. One key use case is the ability to add SSDs as cache and assign them to individual servers, even remapping a connected drive to a new physical server in the event of a server hardware failure. ATTO provides the hardware to convert SAS to Fibre Channel in industry leading stretch cluster solutions from NetApp, Nexenta and Open-E. With proven technology to connect up to 960 SAS drives to a Fibre Channel network, building a solution across campus or across a metropolitan area is easy with XstreamCORE. 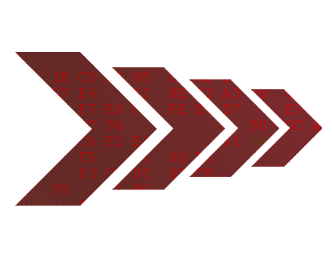 Tape has been a reliable medium for archive and project sharing with technologies like LTFS. XstreamCORE can add shared, long-distance connectivity to tape libraries and standalone drives working exclusively with streaming tape or using tape to complement connected SSD and HDD storage. 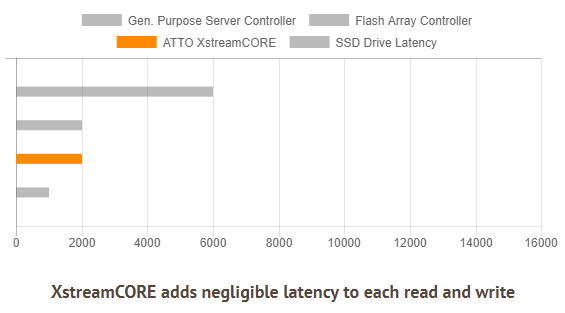 ATTO XstreamCORE pushes the limits on performance, its design was meant to feed multiple servers a consistent stream of data from SSD flash storage. Leveraging hardware acceleration for normal data transfers, XstreamCORE also has the ability to offload read and write traffic from the server CPU, storage fabric and network resources using standard XCOPY commands. ATTO XstreamCORE architecture was designed to push the envelope on performance. ATTO xCORE technology enables the XstreamCORE to achieve up to 1.2M 4K IOPS or 6.4GB/s throughput per controller when attached to commodity SAS storage or RAID arrays. The amount of latency added is extremely lower than server based solutions that convert SAS to other protocols as servers were not designed to efficiently translate between protocols. ATTO offers the widest selection of bridge products in the industry allowing our customers to match a product to their performance needs. Available in rackmount, desktop and embedded form-factors, the ATTO FibreBridge Family is an award-winning line of solutions.